Well, it’s 2013 and I’m back at work. It’s hard to come back after ten days off. Making matters worse, I relapsed back into my cold/flu which really dampened my activities and attitude over the holidays. It wasn’t a terrible flu, just enough to feel weak and crummy. I didn’t have the energy to play golf even once in ten days and required a Vicodin and massive quantities of Bordeaux just to get through the card playing marathons with the relatives. In spite of my depressed spirits, I did manage however to “trim” a few bucks of my kids at the Texas Holdem’ table which will just about pay for the cough drops I’m going to need to get through this week at work. Vacation gives you time to reflect on what it is you’re doing with your life and why. Then you remember, oh, it’s the money. I need the money to pay my bills. Yes, I’m sure that’s it. But you get to your desk, you get a cup of coffee, and you realize it’s not so bad. Steady work and steady pay give you the illusion of security even if, behind the scenes, top management is preparing to sell the company to a Chinese conglomerate with visions of liquidating all assets just to get at a forgotten stockpile of printer ink cartridges in some forgotten warehouse. Anyway, it’s customary for every self-respecting columnist to make at least one New Year prediction. Here’s mine. Steve Balmer will be forced to retire from Microsoft. Microsoft bet the farm on Windows 8, but it won’t be enough to raise the stock price enough to save Balmer. Windows 8 received tepid reviews from the tech press who consider it, at best, half baked. Microsoft’s core markets, corporations and old folks, are exhibiting no urgency to update. Microsoft made a “boatload” of money by exploiting IBM’s laziness and non-belief in the PC market. They then counterfeited the Macintosh OS to work on the “IBM compatible” platform. Finally, they also “outmaneuvered” Lotus to supplanted its lame Symphony application suite with a better suite of office productivity applications, Word, Excel, and Powerpoint. While Microsoft Office seems dated today, at the time, it was much better than the other alternatives. In the early helter-skelter days of personal computing, the absence of any real “standards,” with regard to file formats, networking standards, hardware protocols, cables fittings, etc., opened a window that Microsoft and its myriad of cheap hardware partner “clones” makers quickly exploited. 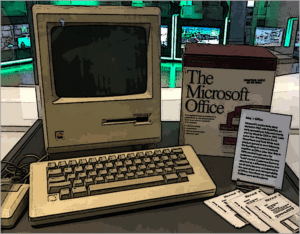 The cheaper hardware, equipped with the same Microsoft OS that ran on the IBM PC, became the “de-facto” standard for business. The rest is history. But aside from these early brilliant business moves, Microsoft really hasn’t added much to the “culture” of computing and their revenue stream, while still strong, won’t last forever. The writing is on the wall, Microsoft must innovate and join the new mobile computing culture or die. Imagination and vision are what they lack. They keep trying to “buy” imagination by acquiring small energetic companies, but the energy quickly dissipates under the umbrella of Microsoft top management. The problem with the acquisition is that most small companies are very entrepreneurial. Once the original founders/coders/visionaries/etc. “cash out” and leave the company, what you’re left with is the low-level coders and administrators. What Microsoft needs is a “Steve Jobs like” visionary – someone with a strong vision of a total mobile OS ecosystem. Not simply the OS, but all the back end services that are required to give users a unified, powerful, simple, and beautiful experience. He should have comprehensive experience driving teams of developers to produce great products and meet tight deadlines. He should be a strong-willed visionary, forceful enough to “bend” those around him to see his vision. He should be a skilled presenter in order to sell his ideas to customers, third-party developers, and stockholders. It also wouldn’t hurt if he had an “ax to grind” with Apple. Who might fit that description? I’m thinking Scott Forstall. Forstall is the perfect CEO for Microsoft. He brings coolness, design sense, technical ability, innovation, and most importantly, mucho Apple DNA right to the top of the Microsoft organization. He’s the father of iOS (the iPhone operating system) and he is intimately familiar with everything necessary for a spectacular mobile computing experience. Best of all, he wants to “bury” Johnny Ive, Tim Cook, and Apple. It is well known that Scott is a “strong-headed” visionary. His clashes with Johnny Ive over style and substance led to his firing at Apple. But a strong and clear vision is exactly what Microsoft is lacking and sorely needs. His firing must surely have negated any non-compete clauses in his contract. The only question is; will the Microsoft board see this opportunity?